"Homegrown in Denver Colorado, Tatanka is a quartet specializing in the sounds of dub, progressive reggae, and electro soundscapes. Heavy Caribbean drum and bass grooves provide the pulse for the party as the music invites you to get down and dirty." The band recently dropped a transcendental six track EP titled "Cloudless Thunder" recorded at Scanhop Sounds Studio, Morrison, Colorado. The band, hailing from Denver, Colorado, can't easily be placed into one genre of music. They tag their heady tunes with the word Moombahton, Cloudless Thunder by TATANKA which is an experimental fusion genre of house music and reggaeton. I would say that can be part of the description, but the music, this album, is so much more. Just like the mysterious feeling you get when you first read the name of the EP and begin to think about how there could even possibly be "Cloudless Thunder", the whole album is full of spacey, full-echoed, Electronica effects, BASS HEAVY, Reggae riddims, smashed together with some Hip Hop influences and topped with inspiring, conscious lyrics to keep you hypnotized. A feeling of wonderment takes over you guided by the words of a combination of conscious, dub vocals from within and outside the group. The album jumps off with a classic Dub Reggae song they call "Border Run." The intro reveals the rhythm of the keys crying alone, accompanied by perfectly timed drum fills and hits with a deep running bass line. A double picking guitar runs along side the bass line as organs sporadically fill the empty space left by the drums and bass sitting in the pocket. True Dub lovers can appreciate the tasteful use of effects spread throughout the album. No lyrics are needed to get your head bobbing with the first track and it is a perfect lead up to the next song featuring the organic, enchanting vocals of Joseph Collepardi, representing Sensamotion Band. The second track, and quite possibly my favorite, is a psychedelic, dub reggae tune sure to pump you up and inspire you with its conscious lyrics. Titled "Turn to Fate feat. Sensamotion", it is a little slower than the first but just as chronic and sure to get you baked deep, deep into the mix. The song is kicked off by hits and a heavy running bass line. As the song builds up to drop, the organ gets louder and the bass notes start to jump around the bubble. The drums drop and Joeseph comes in with the message that lifts you to a higher level, "Keep a mind of Love, that's what we demonstrate. The sound releases energy, the energy escapes. Sending out the vibe, like the artist with the paint. Take the brush unto the wall, the colors Turn to Fate." The added delay and echo effects throughout the song set the mood right. "Show Me Love" is a classic dub reggae riddim intertwined with electronica dub effects, wobbly bass and guitars dripping with reverb. Spaced out with warm vocal cuts soaked in delay, it's another great track by this crew out of CO. The next track, "Shredder feat. Turner Jackson" is a hip hop flavored, hard rocking head bouncer. Turner Jackson indeed shreds this unique tune, surrounded by melodic licks and wobbling, frequency changing deep bass. 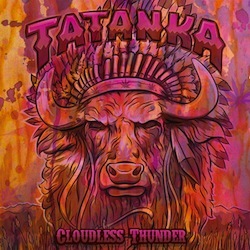 Tatanka drops back into their title track "Cloudless Thunder" with a nasty, euphoric dub track. This joint is laced in deep bass, melodic leads, and house build ups and drops to put you on another planet, one with "Cloudless Thunder". The final track on the EP, "Keep Your Cool," comes in with a Binghi drum & bass beat and more psychedelic effects and leads to keep the spaceship in orbit. The tune turns heavy drum and bass with spaced out lyrics and minimal guitar skanks with great head spinning effects. There's no doubt the entire EP has earned a spot in my reggae play list. Tatanka has made me a stronger fan with this release, collaborating with other artists and heavily dubbing and fusing their music with different influences. They were able to use less lyrics throughout their songs while maintaining the transcendental vibe and positive message of Love.